WASHINGTON (CNS)—Providence Sister Tracey Horan has learned that walking with people—accompaniment, as Pope Francis calls it—can make a difference in the world. She recalled learning the lesson time and again during her work as a community organizer with the Indianapolis Congregation Action Network, or IndyCAN, as well as during her journey toward religious life. Sister Tracey, 29, a second-year novice with the Sisters of Providence of Saint Mary-of-the-Woods, said she has found that the people she works with in neighborhoods and 30 congregations, including the 17 largest, around Indianapolis are the inspiration that fills her with hope in a world beset by injustice. Beginning in August, she became immersed in IndyCAN’s Ticket to Opportunity campaign which ultimately saw voters pass a transit expansion that promoters said will create thousands of jobs and boost access to public transportation for people who struggle economically. 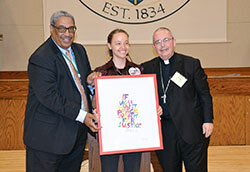 Her willingness to listen to people as they discover the power they hold to achieve social justice earned Sister Tracey the 2017 Cardinal Bernardin New Leadership Award from the Catholic Campaign for Human Development (CCHD), the U.S. bishops’ domestic anti-poverty and social justice program. 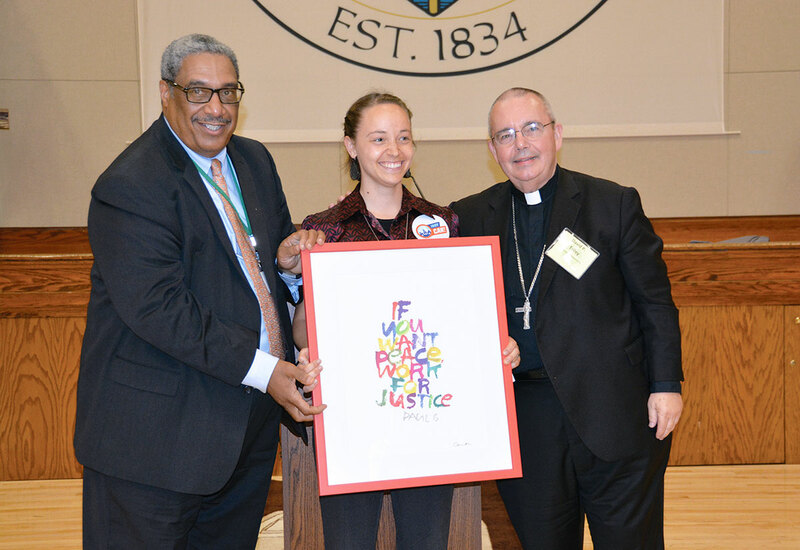 The award was presented on June 14 at a reception in the Assembly Hall at the Archbishop Edward T. O’Meara Catholic Center during the spring meeting of the U.S. Conference of Catholic Bishops in Indianapolis. Sister Tracey, a graduate of Roncalli High School in Indianapolis and the University of Dayton, said she was “both surprised and honored” to win the award because of the short time she has been with IndyCAN. “It gave me a chance to step back and really be grateful for the amazing work I get to be a part of, and the courageous faith leaders that are at the heart of it,” she said. Sister Tracey finds it “really affirming” to be chosen for the award. Each day is different in the organizing world, but Sister Tracey has found that the common bond is the people. From sitting in a Latino leader’s kitchen to discuss his experience with discrimination to reviewing an urgent petition with faith leaders after Mass or a prayer vigil with a family facing the possibility of deportation, Sister Tracey has learned that the greatest treasure she has experienced is accompanying people through their struggles. While researching the issue, Sister Tracey said, she learned about the lives of people who migrate, the root causes of migration and the way the U.S. contributes to those causes, learning about her misconceptions along the way. Sister Tracey said it has been “providential” that her experiences with people on the margins have continued to grow in her religious vocation with the Sisters of Providence. And now she has the support of the sisters and St. Theodora in her work. She could say the same is true of St. Theodora. “I’m amazed at how often I find myself quoting our foundress,” she said. Sister Tracey once shared with community leaders “the story of the way our sisters were targeted by anti-Catholic groups and experienced threats and arson in their early years. In Indianapolis, Sister Tracey is involved in the Indianapolis Archdiocese’s Justice for Immigrants Campaign and maintains a connection with the House of the Little Flower Catholic Worker community to help her stay grounded in the margins of society. Organizing work is long and hard, she said, but worthwhile. “I believe in transformation and walking with people.